Every room at the Casa Art Family Hotel is designed in an artistic and unique way, inspired by the fundamental forces of the universe – Sea, Earth, Sun, Moon, Air, Wind and Love. Each room has its own interior design interpretation with different furniture collections that are available through Casa Art Furniture. 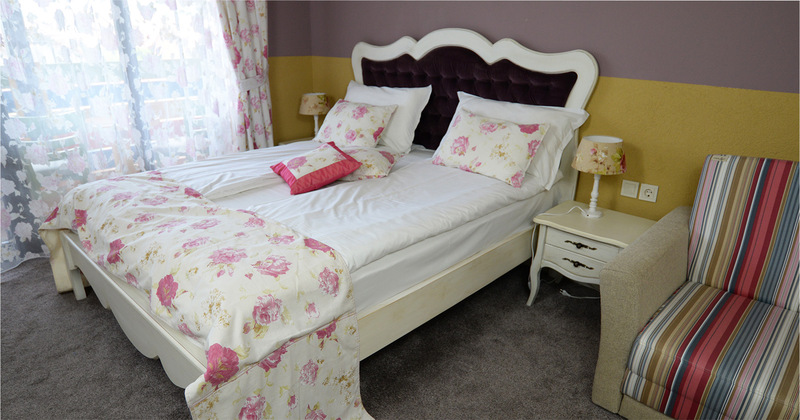 All the studios, rooms and apartments are created with passion, love and a cosy atmosphere. 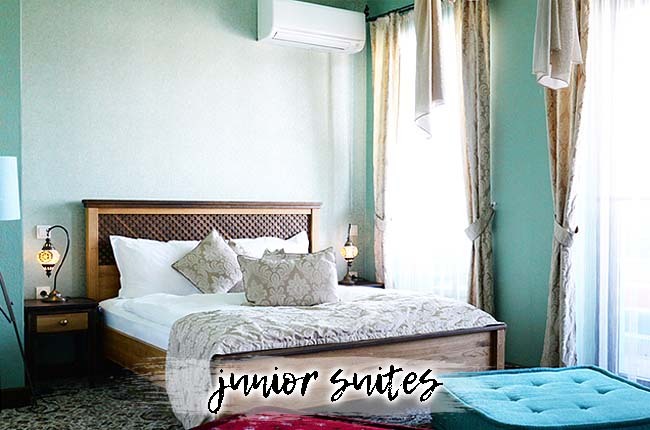 Equipped with modern standards like cable TV, air conditioning, telephone, bathroom and terrace, we invite you to be our guest – during a weekend, vacation or business event! Eco Art thematic room‘s interior design is based on refurbished materials such as old beams, bricks, stones and tiles from traditional Bulgarian houses, some of them well over 300 years old.With these ancient materials we create new and modern furniture in shapes and colors that bring you in contemporary lifestyle. The rugged surface of Eco Art furniture preserves the vintage look and the hundred of years antique soul these materials have brought to nowadays. Our furniture has caught your attention? in our showroom, the Casa Art Family Hotel in Oreshak. The fabrics, symbols and colors in the thematic room Ethnoromance celebrate the joy for life. Symbolisms of ancient cultures, painted on the simple white furniture, the stained glass, imprinted also on the wooden sculptures are an inspiration for the soul and the imagination. Welcome into a room where you feel that it’s all about the simple things in life. 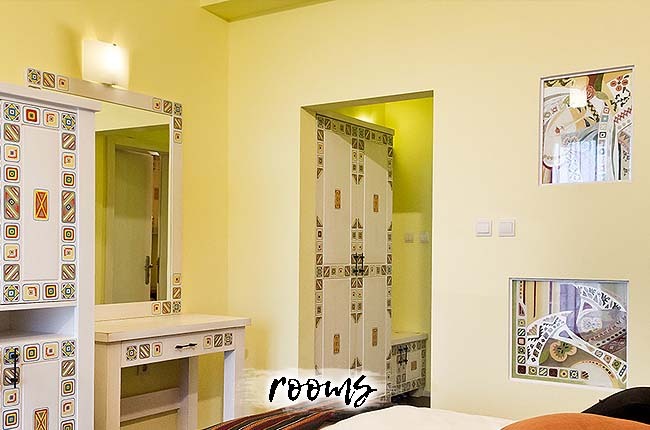 The room Exotica in the Casa Art Family Hotel is inspired by African symbols. Elements of exotic cultures are integrated into the furniture, the walls and decoration in a beautiful harmony of shapes, colors and textures. 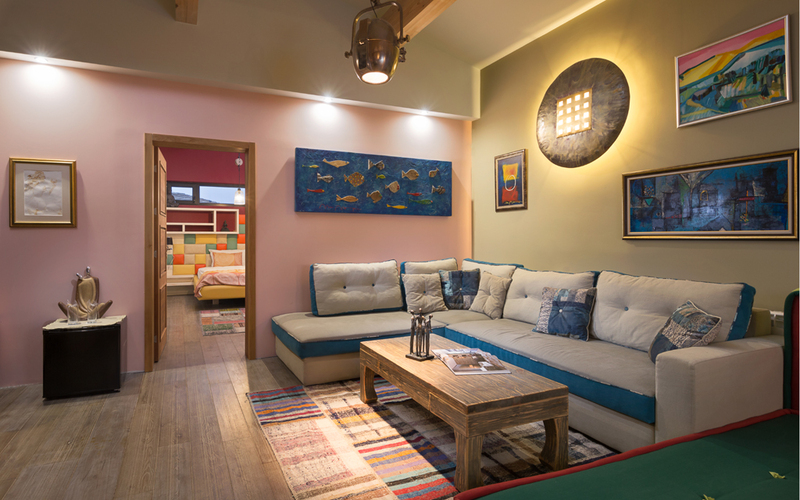 The main wall finish is made out of a special composite plaster of straw & clay, which combined with the wooden floor, create warm earthy feeling of being close to nature. The energy of the room invites you to take a fascinating trip through ancient cultures. The Casa Art Family Hotel offers you with the room Meditation a beautiful view over the surrounding mountains. Еlements and symbols of the east asian culture create an unique and spiritual interior for your perfect relaxation. The idea for the furniture is based on country style Chinese furniture that was popular for its colorful and original design around the 1800’s. Get a deep relaxation at our Meditation room at the Casa Art Family Hotel. The thematic room Poetry is romance for all senses. Poetry is a gift that each of us carries deep within the most hidden place of the heart. The interior design in shades of gentle purple, yellow, and pink roses spread on white, will help you sink into the poetic magic and wait for the fairies to land on your shoulder! The furniture and lighting is kept in a white color with gentle curves in baroc style with pink or old metal knobs. Be romantic and different! Experience an unforgettable magic moment with your loved one in the thematic room Poetry. The thematic room River Stories is an eco-concept, inspiring the creative use of upcycling natural materials, such as fallen branches in the river and stones from the riverbed of Cherni Osam river. 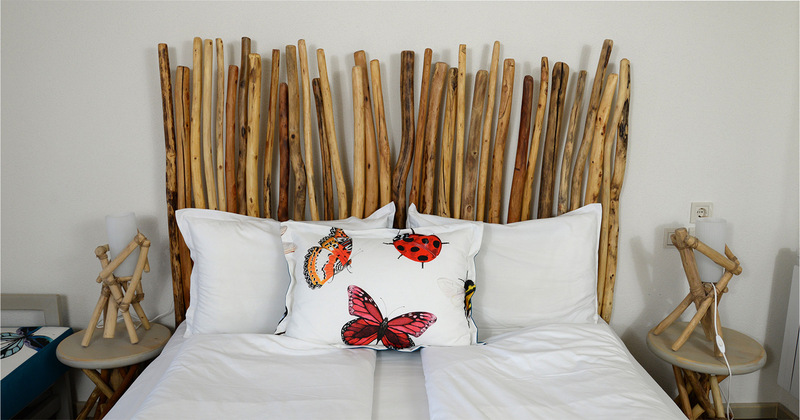 The bunch of willow branches are tied with ropes in odd shapes and form the grundge style coat-hook, the table base, shapes the head-board of bed, the lamps, the decor of the cupboards...whatever the endless imagination can create as unique furniture. 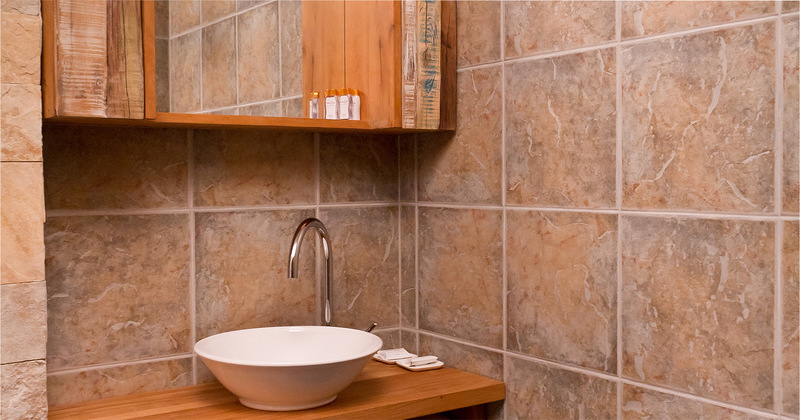 The river stone is used to pave part the bathroom in harmony with turquoise tiles and an aquarium and that all remind you of the river bed. The patchwork curtains & sofa covers bring another bit of grundge. Visit us and enjoy the energy of nature in the River Stories room at the Casa Art Family Hotel. The thematic room Sea Impressions at the Casa Art Family Hotel invites you to experience the power, freedom and beauty of the sea. Seashells on the tables plot and hemp knitting on the bed & cupboards are keeping the memory of salted sea breath. 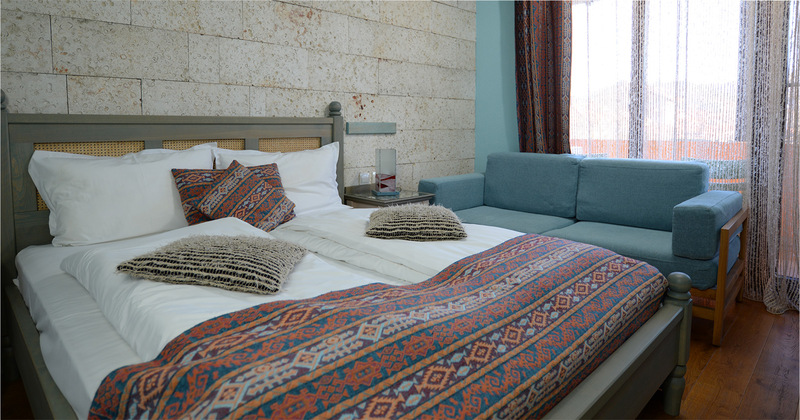 A wall cladded in wonderful limestone from Balchik seashore, that carries the traces of water erosion, brings the feeling of rock in the ocean of the relaxing blue walls and furniture. The last element representing the spirit of the theme is an aquarium between the bathroom and the main room filled with fairytale fishes and Seashells. Cross the threshold of the 1001 NIGHT studio in the Casa Art Family Hotel and enjoy the fabulous world and fascinating atmosphere of the Orient! Mosaic lamps, bought directly from the vibrant Grand Bazaar in Istanbul, inevitably grab its oriental exoticism. The textures in the carpet and curtains bear the typical motifs and symbols of the Orient Modern interpretation of the four-poster bed and cabinet created specifically for studio 1001 night. And with cushions - mattresses, casually scattered cozy carpet, take off like a flying carpet in the fabulous world of 1001 Nights. Feel the spirit of long gone ancient worlds in the studio Ancient Moments. The high, sloped ceiling, with visible, natural color wooden truss, a stately structure, remind of antique temple. Engraved shabby golden bands, temple like frieze decoration on furniture in antique white, bathroom ornaments, stained glass with figures in antique Greek painting style on the wall, all this will bring you back in the times of Sparta, Troya, Homer & Illiad. 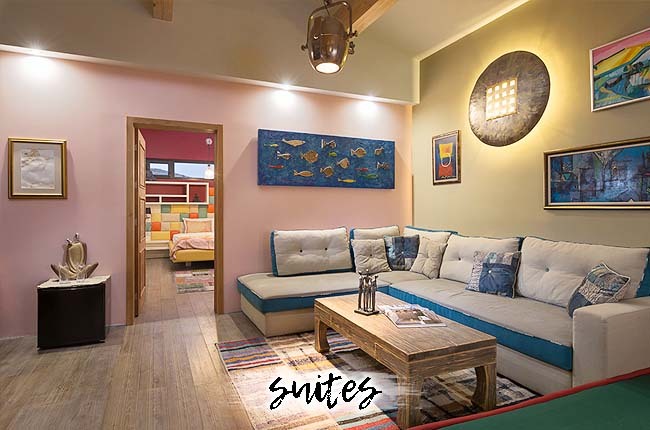 The studio Ancient moments is an exciting space for connoisseurs of antiquity who want to spend a memorable weekend in a different atmosphere. 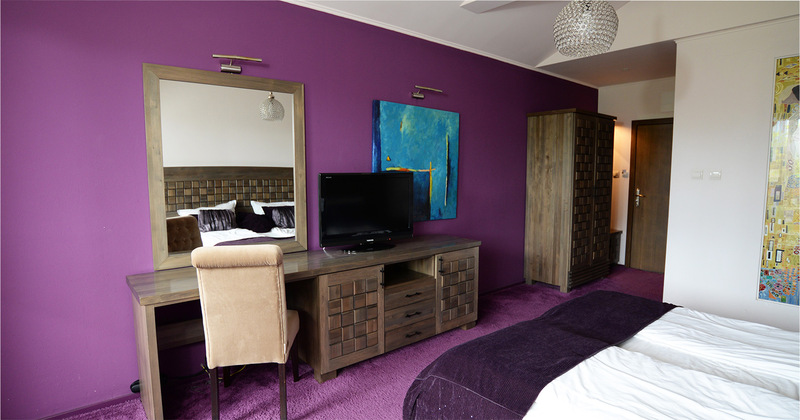 The studio Night Secrets invites you to discover the mysteries of a night in a modern and elegant place, sunk in purple fantasies that awake the desire for relaxation and enjoyment for all senses. The furniture is with modern, linear shapes. The main design features the arrangement of squares with the different direction of the grain, integrated in the bed boards and cupboards doors. A lavish carpet in exquisite violet, curtains and cushions of fine dark purple velvet with sequins, looking like a starry sky, create a magical atmosphere of the room. The PAINT BOX STUDIO is composed of fresh colors taken from a palette of emotions, such as euphoria, passion, and an eagerness for life. This apartment that we have created completely fulfills the main purpose of the Arthotel CASA ART. The painted furniture, created by Plamen Petrov, gives us a chance to forget our monotonous daily life and carries us into the magical world of dreams. In the LEGEND apartment at the Arthotel CASA ART, the furniture, the old beams on the ceiling, the fireplace built from old fireclay bricks, the iron lamps, the old rugs, and the crocheted curtains all turned into this beautiful apartment. The Legend apartment is representative of a secret arena of the past centuries. This amazing, authentic atmosphere is achieved by using old beams from the past centuries. The precious, endangered materials have a deep historical nature, as if they were created for eternity. Every millimeter of the furniture in the apartment is home to a hidden ancient secret. Taste of Legend: The philosophy of each of the rooms at the Arthotel CASA ART is defined not only by the interior, but also by the culinary variety of the thematic menu. Thematic menu CASA ART taste cosmopolitans! Rooms at Casa Art Family Hotel are interpreted not only by interior but also a culinary path. Thematic gourmet restaurant menu CASA ART inspired by emotional imaginations with a cosmopolitan character. In it you will find exotic culinary masterpieces, as well as dishes from recipes copyright owner Biljana Milusheva and our cooking team. * The prices are not valid for periods of public and national holidays , which are valid other offers and package offers. All prices are in BGN.